Last week, perhaps the strangest music video in recent NBA history hit the web. It was a kind of retro, Behind the Music look at a fictional band called Spuran Spuran. 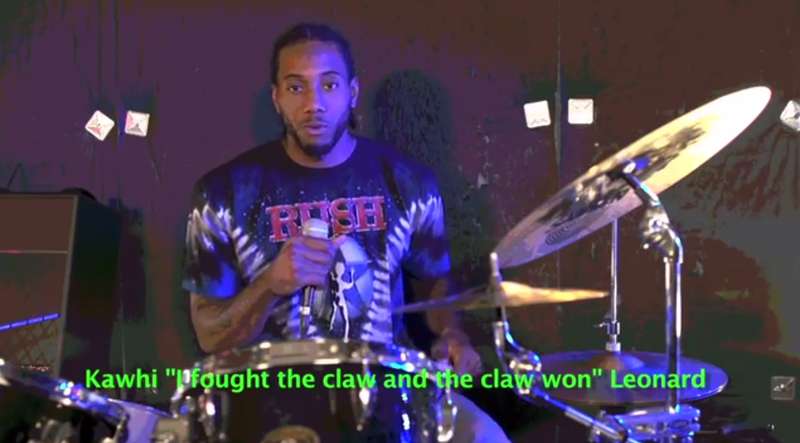 Basically all you need to know is that Kawhi Leonard is behind a drum kit, and you’re sold. Unsurprisingly, Spurs forward Matt Bonner was the creative force behind (and in front of) the camera. We caught up with Bonner to ask him about the music video and how it came to be. Man, first of all, congratulations on your hit new music video! Can you briefly describe how this masterpiece came together? We had no clue this video was going to be so big. We just made it for fun and to make our fans smile. We had a blast shooting it, and I believe projects like this can boost team morale during a long NBA season. Click here for all of our interviews with fascinating people from the worlds of sports and pop culture. While I came up with the idea and was responsible for executing it, the final product was the result of a team effort. Patty [Mills], Kawhi [Leonard], Aron [Baynes], and The Coyote were great sports and we had a blast shooting it. The San Antonio School of Rock let us use their studio, helped with the production, provided the instruments, and re-edited the song. The Spurs camera guys filmed it. My wife, Nadia, and her friend nailed the hair and makeup. Lastly, Tim and Eric were gracious to give me permission to spoof their video. By now, most people know you’re a huge music guy, but how did you recruit Patty, Kawhi, and Aron for this project? Honestly, all I did was ask, and they said yes. Our team is composed of a great group of guys with unique personalities. Being able to give fans a glimpse into some of those personalities through this video was pretty cool. Can you take us through some of your other teammates’ reactions to the video? I’m sure Tim Duncan is a big fan, right? Everyone got a kick out of it. Our team loves this kind of stuff. Let’s be honest, that’s not Kawhi Leonard’s Rush T-shirt, is it? Wait … Kawhi was wearing a Rush T-shirt? That’s wicked awesome! I don’t normally dig “Pop music” (sorry), but Spuran Spuran seems to have a really happening sound. Do you guys have plans for an EP or a tour? Where do you go from here? Right now it’s crunch time and we are 100 percent focused on the basketball season, so any future albums and tours will have to wait. Sorry, Coachella! The original Tim and Eric “Sports” sketch is iconic. How did you get their blessing to produce this version? I literally just Googled them, clicked on their website, and sent them an email. Turns out luck was on my side. They got the message and replied, saying they loved the idea and to go for it. It was pretty “awesome” of them to do that. I can’t thank them enough. OK, one basketball question: Your floater game has always been rock solid, but it seems to be off-the-charts brilliant this year. How are you able to sleep at night knowing you stole Tony Parker’s signature shot? Honestly, I had no choice. It was the result of Darwinism. You must adapt to survive. When opponents would run me off the 3-point line, I started putting the ball on the floor and getting to the paint. Once in the paint, dunks were out of the question (for obvious reasons) and layup attempts inevitably ended in disaster and/or the third row. That left one option: the floater. Our coaches and player development staff worked hard to help me add that shot, so I give them all of the credit.